You may find Young dressed in Scottish Highland garb clad in a kilt playing at civic function and fraternal groups throughout town. When Frederick “Rick” Young was growing up, his home was always filled with the sound of bagpipes. His father had an affinity for the genre growing up and instilled an appreciation for the music in Young. At the age of 50, Young decided to go from listening to the music to playing it. Today, you may find Young dressed in Scottish Highland garb clad in a kilt playing at civic functions and fraternal groups throughout town. Young said he was just shy of 50 when he decided he wanted to learn how to play. A friend had recently bought a set for his son, and so Young inquired as to where he could get lessons. So, he bought some inexpensive bagpipes online and headed off to take lessons. He said the first lesson he learned was not to buy inexpensive bagpipes. His instructor told him his set wasn’t particularly good, and so he wound up buying another pair. From there, his instructor started him off on a chanter — or the part of the instrument used to create the melody. Every culture has their own take on the instrument. Young opted for the Highland bagpipe that has nine potential notes. He said his wife wasn’t particularly thrilled about him picking up the instrument, but she was happy the instrument helped Young to kick a 36-year smoking habit. She joked that she’d like the bagpipes if Young learned to play the Beach Boys. So, Young sat in his room and learned to play “Surfer Girl” for her. While playing music is part of the enjoyment for Young, he also appreciates the historical ties that come along with the instrument. In the 1970s, Young and his son started going to historical reenactments due to a shared love of history. By the 1980s, Young’s wife joined in. For years, the family participated in Scottish reenactments through a group called Clann of the Wolf, and Young served as the bagpiper. He said he’s always had a fascination with the Scottish culture, and his father, an avid genealogist, traced their family’s potential lineage to Scotland. “This was a chance to recreate and get a taste of [the culture],” Young said. A former volunteer with the Moorestown Fire Department, Young used to receive frequent requests to play at different functions. To this day, Young still plays for civic groups and fraternal organizations. 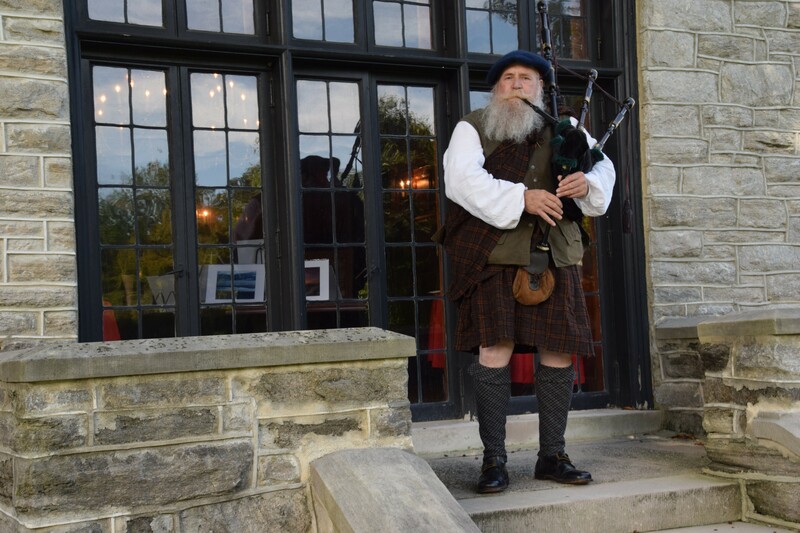 When people request a bagpiper, they typically expect them to wear a kilt, so Young dresses the part. He said there are bagpipers who were suits or tuxedos, but if he’s at an event, he’s wearing a Highland kilt and vest.